William – from Netherlands and his wife joined in our city walk on June 10. Hoan Kiem Lake, Post office, Ngoc Son temple, The Huc Bridge, Walking Street. Are those places familiar with you? We bet you will say yes because every weekend you probably often spend time in this area hanging out with family and friends, drinking beer and people watching …and you think that there isn’t anything you don’t know about the area. Hold on and give us a chance to show to you a different new view of this special place as William did. William is from the Netherlands. He and his wife moved to Hanoi 1 year ago and now he is working at Metropole Hotel as General Manager. Through advice from one of his friend, he and his wife registered to join in our walk. 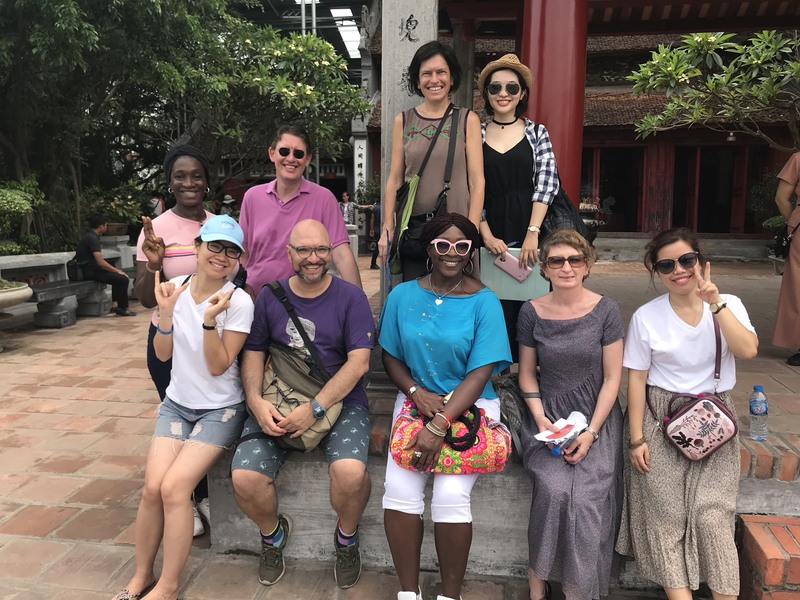 We met in front of Ly Thai To statue (12 Le Lai Street) at 9 a.m and together we enjoyed a wonderful Sunday morning walk around Hoan Kiem Lake discussing its points of interest, the stories, history, legends and traditions. 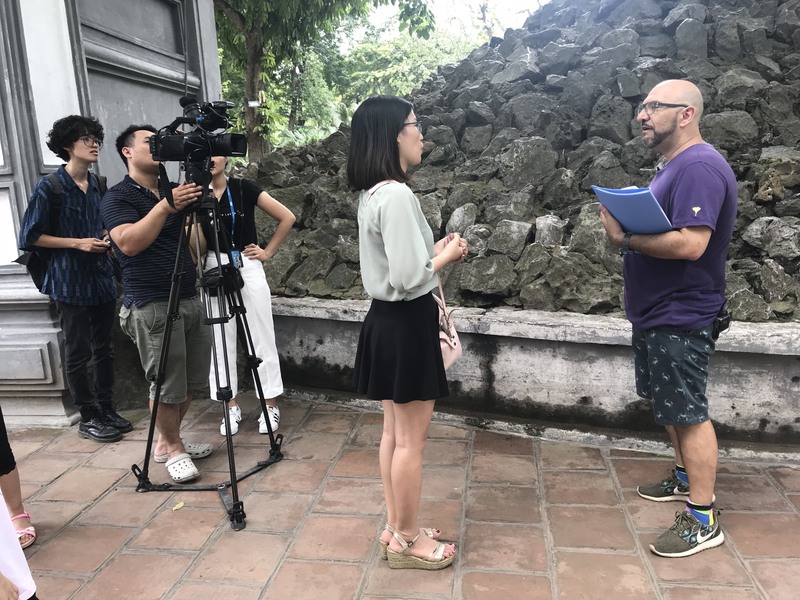 William said that he learned a lot about Hoan Kiem lake area’s history and its beauty in an interesting and charming way – which was thanks to our guide (Mr Alvaro). He and his wife plan to join other activities like city tour walks, watching movies, excursions to traditional villages etc. in the near future and especially the Water puppets show which be held on Saturday June 23. Ronke – from Nigeria and her sister joined in our city walk on June 10. She has lived in Hanoi for 3 years and said she fell in love with Vietnam at first sight. We found out that she wore a nice T-shirt bearing the Vietnam map showing many places familiar to Vietnamese people. When we asked her how many places has she visited in Vietnam, she said over 15 cities and provinces and she was especially impressed by the wealth of the Me Kong Delta such as its nature, people personalities, agriculture. Last year she spent most of the summer in Ha Giang finding out about local life and discovering the beauty of rice season in here. She said that she was very happy to have a chance to join in our city tour walk. “The tour was very informative, the main purpose was very clear and the guide was just perfect and knowledgeable about the places which we visited. Alvaro talked not too fast not too slow and easy to follow up. “said Ronke. After taking this tour, she definitely plans to sign up as a new FVH member and is looking forward to more FVH events. Many thanks from Friends of Vietnam Heritage Group. Friends of Vietnam Heritage Group always welcome friends who share a big love for Vietnam’s culture and the people. Join and find more about its true beauty. Please visit our website and follow us on Facebook to catch up with variety of interesting activities. This event is being run in association with the Zo Project. Introduce dó paper: history, characters, uses. Introduce tools: needles and threads, rubber hammer, chisel, glue (PVA), decorative pieces. Introduce some types of notebooks to choose from. Demonstration of binding a notebook. Email Stella (the event organiser) to register. Village in Thái Bình Province, approximately 130 kilometers from Hà Nội. The village has over 300 years of Water Puppet history. We will learn about this village‘s individual designs and its unique equipment used to control the puppets; after that we will experience a special performance. Currently, there are some 20 members of the Đông Các Water Puppet group; we will meet the group‘s head, the two Deputies and some of the troupe‘s members. Some of the Ward‘s troupe‘s members‘ families have handed this craft down through the centuries. For the troupe members Water Puppets are a first love, but most of the puppeteers must now work in agriculture, carpentry or masonry in order to have enough income to raise their families. The oldest troupe member is 84 years old and the youngest is 35. Presently only two members, aged 65 and 68, are skilled enough to make the puppets and have only four assistants learning the craft. It is truly a rare and endangered art form. Hữu Ngọc once wrote an article – ‘Do Water Puppets Talk?’ Maybe on this trip we‘ll answer that question. Bring a packed lunch or have lunch in a nearby local restaurant. Max 29 pax. Email John to register. Max 12 people. Email Stella (the event organiser) to register. This walking tour gives an overview of the changes to Hanoi that started in the French period (1869-1954). 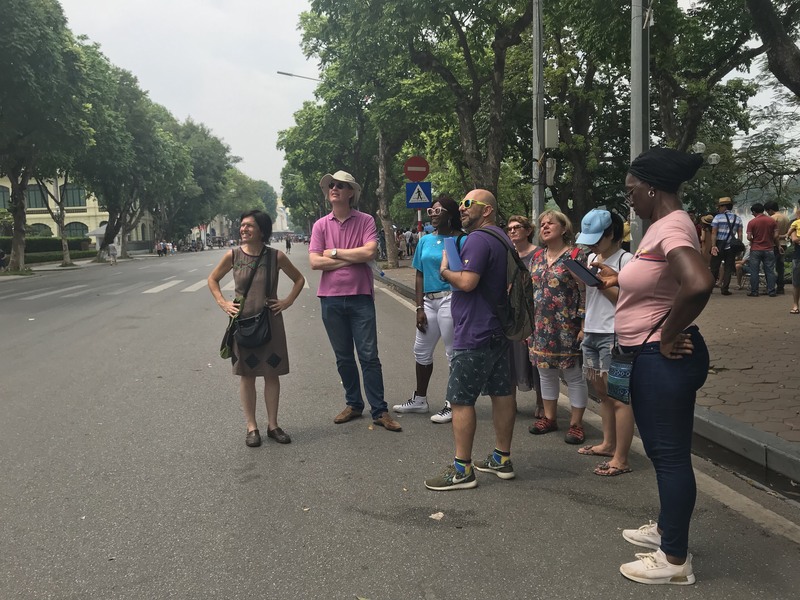 We touch on the development of the education system, town planning and architecture (including that of the political and diplomatic centre) as well as other eclectic information regarding past and present Hanoi as we walk along. Starting at Chu Văn An school (established by the French as the High School of the Protectorate, and now one of the oldest institutions for secondary education in Indochina) we make our way to Hanoi’s iconic Ba Đình Square and focus on a few of the key government buildings in the area (eg. the Central Committee of the Vietnamese Communist Party – formerly the Lycee Albert Sarrault High School – and the Ministry of Foreign Affairs etc.). Then along Chùa Một Cột street and strolling the surrounding avenues passing former villas now home to various Embassies. Our leisurely walk will take us to Điện Biên Phủ and into Hoàng Diệu street ending our tour at Cửa Bắc (north gate) and Cửa Bắc Church in Phan Đình Phùng street. For those whowould like to stay on for lunch after we will walk to nearby Ngu Xa island for some phở cuốn.